The Hotel is located in the beautiful area beneath the castle of Madonna Rocca, presenting to its guests a unique exciting view over a changing landscape turning into incomparable memories. The historical centre and most important tourist attractions can be reached on foot (taking the stairs) or with a town minibus. A small cosy hotel, run by the family Lombardo since 1969. The owners of the Hotel in person take utmost care of the guests, most of whom are frequenters and have left their gratitude in four "Golden Books". 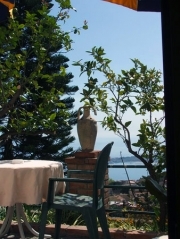 "Villa Greta" has a reputation for particular tranquillity, a beautiful view and an excellent cuisine - Sicilian, vegetarian and fusion, thereof indicated in many international touristic guides, such as "Dumont" and "Rough Guide", which are popular all over Europe. Immersed in the luxurious garden with Mediterranean and subtropical flora, the Hotel offers ideal conditions to relax and enjoy the generous Sicilian Sun (solarium). The Hotel features 18 rooms, all on different floors, all having balconies or terraces, each of the guest rooms is individually furnished and decorated. In the main restaurant you can enjoy the view of Etna and enchanting Giardini-Naxos Bay as well as the menu made by the Hotel owner personally, offering traditional dishes of an island cuisine, notably many of them include fresh fish. Also you can savour a wide choice of best wines and Sicilian liquors satisfying most demanding tastes. A wide selection of snacks is served in buffet once a week during High Season. In summer period you can visit open-air Restaurant alla Carte "Le Chams", which is situated on the terrace with a panoramic view. Here you can enjoy mouth-watering selection of traditional dishes and fusion cuisine, everything is garnished with the starry sky and an incredible breath-taking outlook. Transfer from Catania airport "Vincenzo Bellini" on request. Booking of a parking lot near the Hotel at the price of 5 Euro for a car. Possibility to use a safe deposit box at the price of 2 Euro a day or 10 Euro a week. Reception is always ready to offer information on excursions and places to visit all the year round. On request we organize individual or group excursions to vineyards, situated in the productive area of Etna. Information on car or scooter rent. During summer period there is a service of a shuttle-bus from and to the beach with chaise lounge and beach umbrella. During winter months (November/December and February/March) we organize traditional Sicilian cooking lessons on request for at least six persons, dinner included.